Ah, dear readers, another weekend is upon us. Of course, many of you will be attending fabulous Fashion Week activities, but what about those of you who are not connected to (or just don't care about) Fashion Week? Whatever shall you do? It's New York, of course, so there are about a million other things to do, but your MatchGirl has a couple of good best for you North Brooklyn residents. 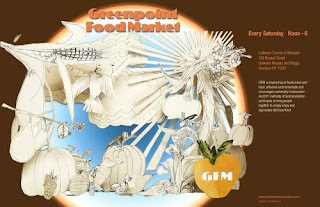 This (and every) Saturday, friend of Unemployed Brooklyn Joann Kim presents the Greenpoint Food Market from noon to 6 PM at Church of the Messiah (129 Russell Stree, between Nassau and Driggs). The Food Market promises loads of local and DIY food and drink for every palette. Among the participants are Mama O's Kimchee, Kombucha and Brooklyn Brine. There will be a food based performance and a bake sale to satisfy your sweet tooth. I'm really excited to have this amazing community based event happening in the neighborhood. I think it'll be a great time! On Sunday from 1 to 5 PM, Lydia Bell brings a performance piece to East River State Park as a part of Perform Williamsburg. Originally funded by FEAST, a community dinner in Greenpoint that funds new and interesting art projects, Will Work For Pay is a performance piece utilizing un and underemployed artists-turned-dancers. It aims to create a discreet economy in which artists are paid for creative research. This project suggests a new model of connecting artists to resources by using the art itself as a means of communication. A couple of very cool things to check out, gentle ones, without even leaving the neighborhood.